Just six months into the college’s 2018 fiscal year (which began July 1), the sum is $2.7 million higher than new grants and contracts awarded in the entire 2017 fiscal year, and $3.9 million higher than those awarded in the 2016 fiscal year. The grants will be used to explore a wide range of health science issues that align with the college’s vision of solving problems in challenging healthcare environments. Some of the largest awards went to studies focusing on immune response, treating alcohol disorders in the mentally ill, autism and sleep disturbances, addiction, the underlying mechanisms of sleep, and lifestyle and health variances in twins. A total of 21 new projects received funding. $10 million in grants will help further medical research and community medical training at WSU Spokane. Research grants also signal a boost for the local economy. 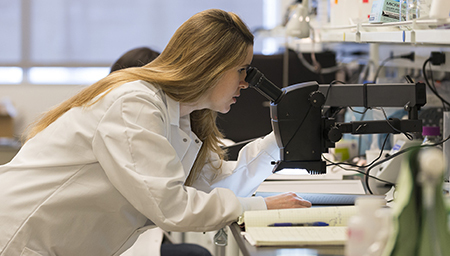 In addition to creating job opportunities for researchers and supporting roles, expanding research increases the Spokane area’s portfolio of health sciences expertise and aids in business interest from health science companies. The Elson S. Floyd College of Medicine is a community-based medical school, named after WSU’s late president Elson S. Floyd. It was created to expand medical education and health care access in communities across the state. Accredited in October 2016, the college welcomed its inaugural class in August 2017.